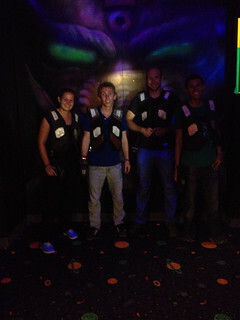 Last Saturday we went for our fabulous laser tag event. We met up at Laserdome i North Vancouver where we were going to play our laser tag games. A birthday party had just been celebrated before we arrived, so a few kids were still running around having lots of fun. Luckily we avoided all the small kids inside the Laserdome… these kids were way too energetic. Before entering the playing field/laser dome we were given a wests and plastic guns. We had to hit certain spots on the west in order to get points. And of course we also had to avoid getting hit by the other team. We were only four people playing but it was still great fun! Even though we only played for 30 minutes, we all quickly realized how exhausting it is to play laser tag. You’re almost constantly running around, up and down ramps, and trying to hide in different positions. You’re focus is constantly on finding a new good spot where you can shoot your opponent. After playing in team we tried an all against all match. This was of course even harder because now you really had to keep a constant focus on people shooting you from all kinds of different spots. Thanks to you guys who joined this cool activity, and looking forward to see more people for our next weekend activity next Saturday where we’ll be going to Queen Elizabeth Park. 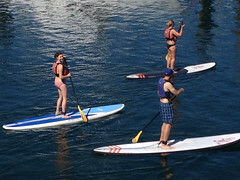 Last Saturday we went to Granville Island to do stand up paddling. So, what is stand up paddling? Well, basically it’s you getting equipped with a big surfboard and a paddle, and then off you go to the water trying to keep your balance on the board while paddling. Well, actually it was a bit more than just that. We met up in front of the Ecomarine Paddlesport Centre at Granville Island half an hour before doing the stand up paddling. We all had to sign a few documents, change to proper clothing for the activity, and of course get equipped with a paddle. After this we went to a small habour where we got our life wests and boards. Since we were nine people for this activity, we had to split up in two groups. However, this didn’t matter. When not doing the stand up paddling yourself, it was great fun to watch the other group. Before paddling out on our great adventure we had a quick tutorial in how to stay calm and keep control while paddling in the area of Granville Island and Sunset Beach. As we went out on water it was definitely exciting and sometimes a bit challenging to navigate in between some smaller boats. However, almost all of us managed to stay on the board. This was definitely a fun experience. For those of you who didn’t have the chance to join this activity surely it can be recommended to try it out! Also remember that you’ll have the opportunity for joining another great activity this Saturday, September 13th, as we’ll be playing laser tag at Laserdome in North Vancouver. What we did this week… as always it was amazing! 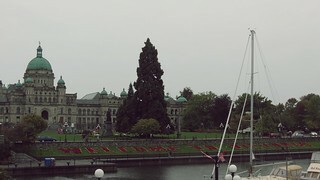 The INTERNeX group went lost and found its way back again in Victoria. As you might remember we were stuck on an island last Sunday due to bad weather conditions. Once again, a moment that let us realize one of the many differences between Europe and Canada. Here, many things are still so much more dependent on the force of nature. But we made it! Back in Van City we jumped into the planning of October: The month of Thanksgiving and Halloween. Are you already looking forward to a Thanksgiving dinner with your homestay family? Or are still looking for something to do? Remember that INTERNeX will offer you guys a Thanksgiving dinner, you just have to vote on the date. Besides the dinner plans, we also had our weekly smart saver again, and shared with you some details of our research concerning where to get cheap breakfast. And for those of you who were frustrated by the fading sun and the seemingly ever present rain, we looked for some stuff to do indoors. One of us went to explore the depths of an enchanted store downtown, where everything becomes possible if you like books. And as a change to the office life, we had our PuB and CluB NiGHT on Friday. 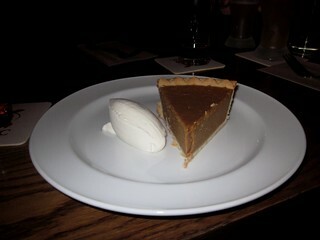 We went to The Cambie and to see how much fun we had there, you just need to take a look at Facebook on Monday. The pictures will tell you everything. 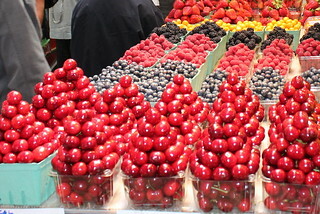 The only thing left to do for this week is to enjoy the walk through three of Vancouver’s neighborhoods this afternoon. If the weather continues to be as pleasant, it will be a very nice and relaxed way to discover parts of this beautiful city.